Carex Health Brands®, a leader in the development and manufacturing of in-home health products for more than two decades, introduces a new Bed Buddy® line of plush, Herbal Naturals™ products infused with aromatherapy and offering moist heat-penetrating relief from aches, pains, tension or arthritis. The new line is comprised of three distinct products, each of which feature the company's proprietary moist heat ThermaTherapy® penetration system, which is shown to be better for treating muscle pain, chronic aches and pains, and arthritis than "dry heat" because it allows quicker, deeper heat penetration into the joints. The Neck Pillow easily drapes over the neck and shoulders to provide deep moist heat to sooth aches, pains, tension or arthritis in the neck and shoulders. 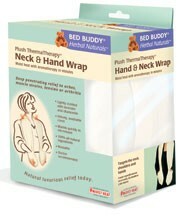 The Neck and Hand Wrap, which features a unique design that includes warming hand pouches, minimizes aches and pains in such chronic problem areas as the neck, hands and shoulders. The All-Over Comfort Pack targets a wide array of chronic pain areas such as the back, hip flexor, shoulders and abdomen with a large, universal shape that easily molds to the body for comfort. The new Herbal Naturals products are soft, lined with luxurious real lavender and chamomile; contain only 100% all-natural ingredients; warm quickly in a microwave; are fully reusable with a machine washable cover; and remain heated for up to an hour. A member of Carex's global family of premium-quality brands, Bed Buddy offers a versatile and premium-quality line of reusable hot and cold packs that support individuals suffering from aches, pains and arthritis, are designed to fit most body types, and help people of virtually all ages and health profiles. 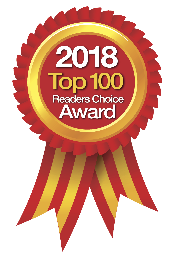 Carex Health Brands, a leading provider of in-home health products for more than two decades, carries a Swivel Cushion crafted specifically to help users get in and out of a vehicle or chair. It also reduces pressure on the spine while sitting. Featuring a comfortable molded foam cushion with the center cut out, Carex’s new Swivel Cushion, which raises any seat two inches, also offers all of the benefits of a ring cushion, including pain relief or prostate-related discomfort. The Swivel Cushion’s unique design also restores the natural lumbar curve by tilting the pelvis forward, thereby helping prevent back strain. Also useful for reducing strain on a user’s knees and hips, this new cushion provides seating comfort for pregnant women, new mothers, and patients recuperating from surgery. 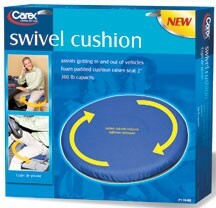 In addition to its 300-pound weight capacity, the Swivel Cushion from Carex Health Brands features a non-skid base and a removable cover that is machine-washable. For more information, visit online.